1. The Hawaiian Islands are Earth’s most isolated parcels of land lying in the middle of the North Pacific Ocean some 2,400 miles from both the nearest continental land mass, North America, and other island of Polynesia in the South Pacific. Parts of Asia are as much as 3,500-4,000 miles distant. 2. The State of Hawaii is composed of as many as 132 named islands, reefs, and shoals that sit atop 107 volcanic mountains. The archipelago extends for nearly 1,600 miles across the North Pacific Ocean from the “Big Island” of Hawaii to the Atolls of Midway and Kure. Amazingly, only about 1.5 percent of the Hawaiian Volcanic Mountain Chain, the Hawaiian Islands, is actually above sea level. If stretched out across the continental states of the U.S., Hawaii would extend from just east of Houston, Texas to San Francisco, California. 3. 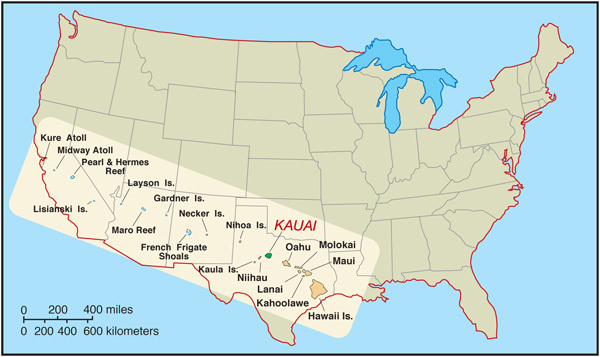 The eight main high islands of the Hawaiian Archipelago, comprising over 99% of the archipelago’s 6,425 square miles of land, include Hawaii, Maui, Oahu, Kauai, Molokai, Lanai, Niihau and Kahoolawe (listed in order of size). They occupy the southeastern 320 miles of the volcanic mountain-island chain from the youngest island of Hawaii to the 5 million year old Kauai Nui island complex of Kauai, Niihau and the tiny island of Kaula. The State of Hawaii is the country’s fourth smallest state, being larger than Rhode Island, Connecticut and Delaware. 4. Hawaii includes some Earth’s largest mountains, rising from oceanic depths of greater than 18,000 feet to summits nearly 14,000 feet above sea level. Mauna Kea and Mauna Loa on the Big Island are volcanic mountains with relief approaching 32,000 feet, from sea floor to summit. 5. The volcanic mountains of Hawaii are our planet’s largest and fastest growing mountains. The entire Island of Hawaii, with its five huge volcanic mountains of Kohala, Mauna Kea, Hualalai, Mauna Loa and Kilauea, listed from oldest to youngest, is less than 450,000 years old. Mauna Loa is Earth’s largest mountain; Mauna Kea may be its tallest. 6. The high islands of Kauai and Niihau, along with small Kaula, represent the tip tops of the 5-million-year-old volcanic mountain-island complex of Kauai Nui. The submerged volcanic mountain portions of the Midway and Kure Atolls at the northwestern end of the 1,600-mile-long Hawaiian Archipelago formed nearly 30 million years ago at the present location of the Big Island of Hawaii. 7. 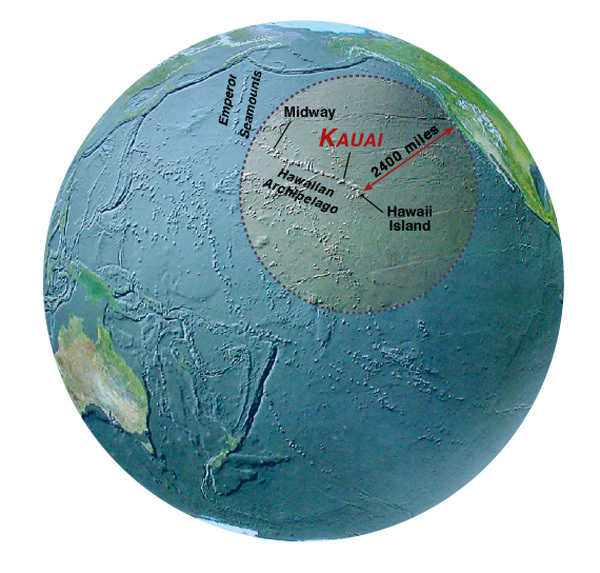 An undersea portion of the nearly continuous Hawaiian-Emperor Volcanic Chain, the Emperor Seamounts, extends north and northwest of the Hawaiian volcanic mountain-island chain another 1,600 miles beyond Midway and Kure to make the entire volcanic mountain chain over 3,200 miles in length. It is composed of nearly 130 volcanic mountains and represents volcanism that has been going on for nearly 80 million years as the Earth’s Pacific Tectonic Plate has moved across the Hawaiian Magmatic Hot Spot at a rate of about 3.5 inches per year. 8. Owing to severe isolation, the Hawaiian Islands are biologically unique. They were colonized initially only by a few species of land plants and animals that were suitably adapted for the long journey over 2,400 or more miles of open ocean. Before the arrival of its first human inhabitants, Hawaii was the home only to plants, birds and insects – no flightless land mammals or reptiles. Many birds exhibited a flightless habit owing to the lack of ground predators. Even in the surrounding ocean the number of coral species is considerably limited, with only 5 or 6 common species, and nearly 25% of inshore fishes are endemic (i.e., only found in Hawaiian waters). Over 4,300 native species of plants and animals, dominantly insects, exist in the eight high islands of Hawaii. The nearly 1,000 native plants, mostly endemic, evolved from as few as 280 original plant colonists arriving and becoming established over 30 million years of geological evolution; 100 endemic bird species evolved from as few as 15 original aviators. 9. The islands of Hawaii were one of the last places on Earth discovered and occupied by humans. There is little or no evidence of human contact of any kind before about 800 A.D. The first significant colonies, made by ocean voyaging Polynesians, were not established until around 900-1000 A.D. Modern contact was not made until only 235 years ago when Captain James Cook set foot on the leeward shore of Kauai on January 19, 1778. 10. Kauai is geologically the most mature of the main high Hawaiian islands with extensive development of broad, lush erosional valleys and prominent coastal features as fringing coral/algal reefs and extensive sandy beaches. Since the end of its growth around five million years ago, the volcanic mountain-island has decreased in land area by half as it subsided over 3,000 feet from well over 8,000 feet to it’s present maximum height of 5,243 feet at Mt. Kawaikini. Nearby Mt. Waialeale (5,148 ft), with its rain gauge in place since 1912, has recorded an average annual rainfall of 423 inches. Spectacular Waimea Canyon, at over 2,500 feet deep, is Hawaii’s largest structural/erosional valley. The North Pacific wave-eroded, 4,000-ft-high Na Pali Coast is one of the planet’s most scenic sea cliffs. Nearly half of Kauai’s 110 miles of coastline is lined with sandy beaches derived mainly from the abrasion of the island’s compound fringing reef platforms built up over hundreds of thousands of years. For more information on these and many other features of Kauai, and the rest of the Hawaii’s chain of volcanic mountain-islands, check out our book – Kauai’s Geologic History: A Simplified Overview.